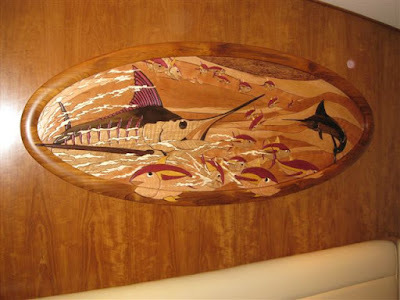 This mural depicting the majesty of a black marlin bursting through the surface of the ocean was completed in March 2011. 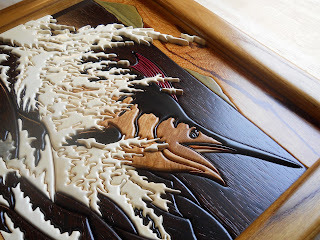 This piece was commissioned by Peter Wright, editor at large of Marlin Magazine. This mural is smaller in scale, 20" X 18". Completed in the winter of 2010, this mural belongs to Bayliss Boatworks. 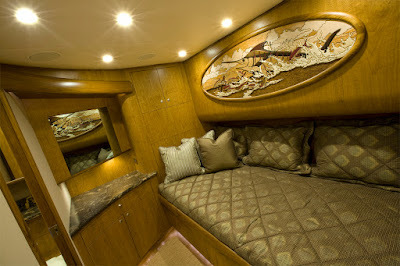 The sportfishing yacht depicted in the artwork is a copy of a custom yacht built by Bayliss Boatworks. 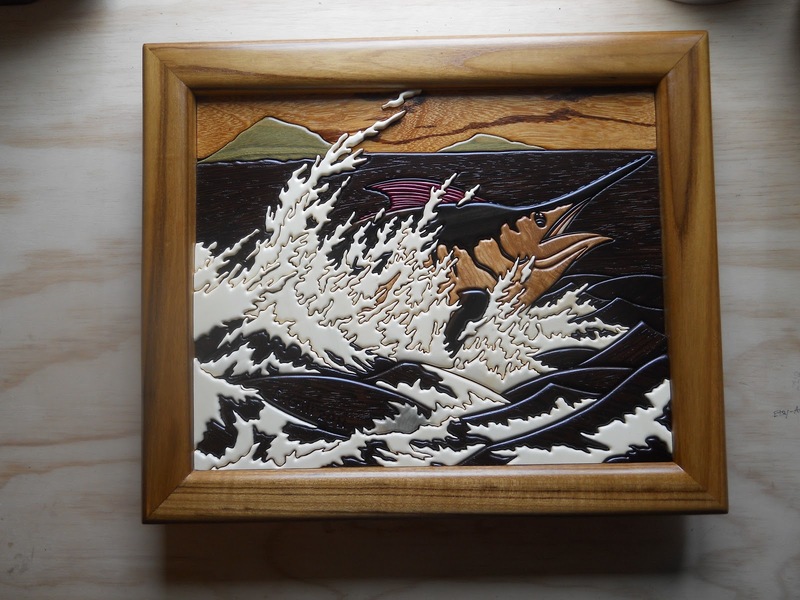 A solid piece of tulip wood gives the impression of a red sky over night waters. This mural was created for the salon of the sportfishing yacht, "Reel Estate", and was completed in the summer of 2010. 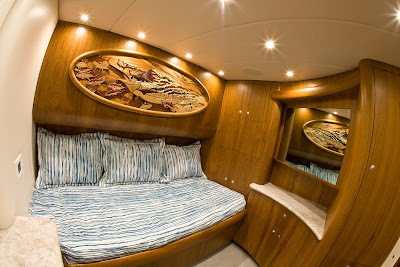 In an attempt to create drama and movement we have incorporated the artwork into the frame. 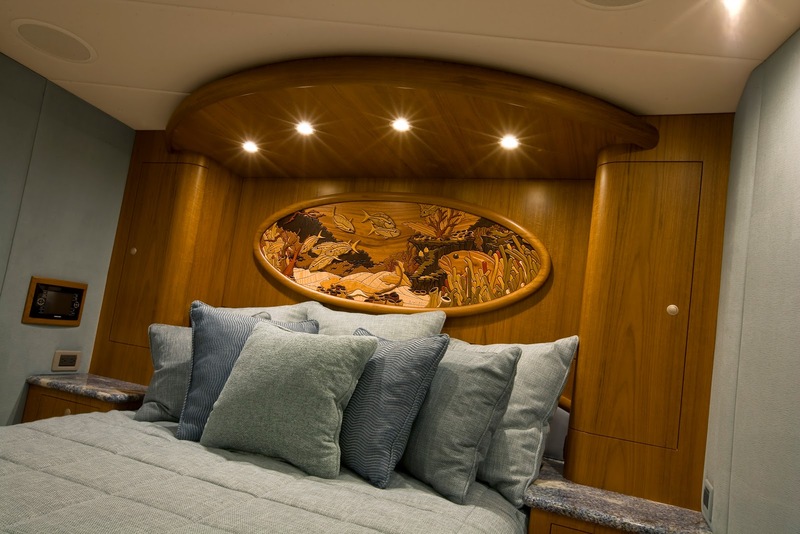 Completed in the summer of 2010, this mural hangs above the bed in the master bedroom of the sportfishing yacht "Lights Out". This depiction of a coral reef as seen under water consists of over 20 different species of wood. Also for "Lights Out" and completed in the summer of 2010, this mural rests on the back of the pullman bunk as a fixed piece of art. 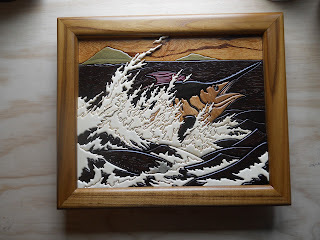 This piece depicts a marlin's attack on a school of yellowfin tuna. This mural was created for the "Uno Mas" sportfishing yacht in 2009. The "Uno Mas" adorned with this artwork was featured by Bayliss Boatworks in the 2010 West Palm Beach International Boat Show. This piece was a collaboration between two artists. Carey Chen provided the sketch and from that drawing Funktional Art produced the finished artwork. The mural rests on the back of the pullman bunk in the yacht as a fixed piece of art. These murals were completed in 2004 for the North Carolina Center for Wildlife Education. They were commissioned by the state of North Carolina to provide a visual depiction of native flora and fauna to the region.